Lake Havasu is a boater's paradise, a place where adrenaline and tranquility exist side-by-side. The people here are known for being welcoming, friendly and relaxed. All types of boaters are warmly welcomed on Lake Havasu's sandy shores! If you have a family, you'll cherish making lasting memories on a sparkling clean and calm lake. Take a slow pontoon ride through the Bridgewater Channel. Play on a sandy beach or cove. Enjoy adventures aboard a wakeboard or waterski, and do so much more . Cherish making lasting memories together, on a sparkling clean and calm lake. 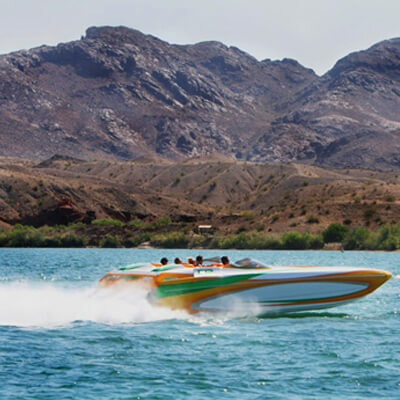 If you have a need for sport or speed, take your lake boating passion to new levels on Lake Havasu. Except in the no-wake zones, there are no size restrictions or speed limits on the lake. 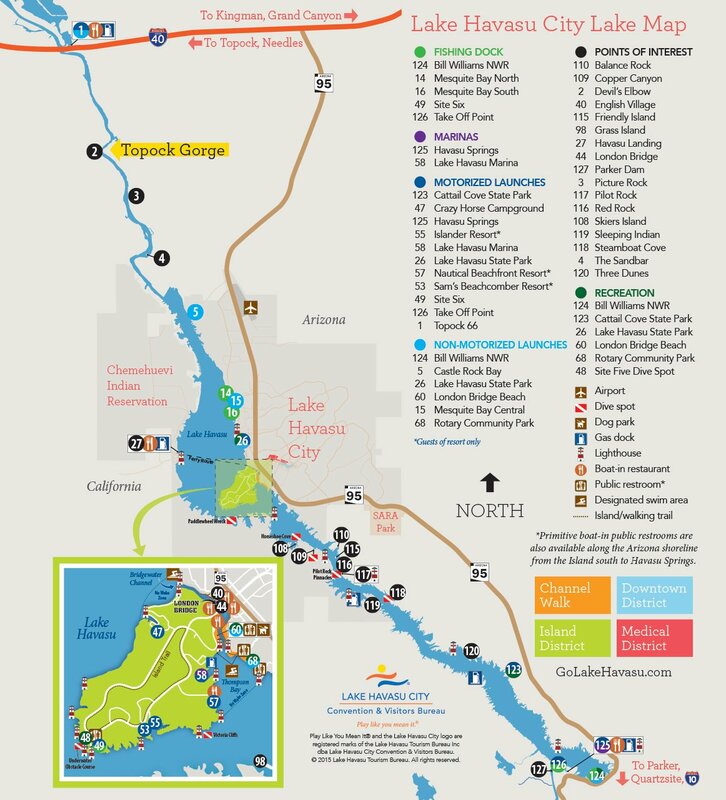 If you enjoy sightseeing and exploring, Lake Havasu has easy access to coves, beaches and other boating attractions . Amenities include barbecue grills, portable restrooms, and shaded picnic tables. You can also explore the river, with its many scenic canyons, cliffs and abundant wildlife. 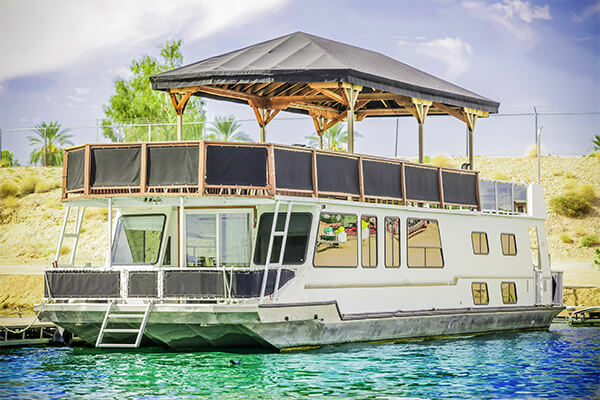 If you want the ultimate lake boating experience, rent a house boat on Lake Havasu ! Enjoy the amenities of a hotel while exploring the lake and lower Colorado River. All who take part will have the vacation of a lifetime. Lake Havasu City is centrally located along 60 continuous miles (30.16 sq. miles) of lake and river waterways. Unlike some other lakes in Arizona, Lake Havasu remains at a near constant water elevation year-round. Lake Havasu City enjoys 300 days of sunshine a year, so you can plan your lake boating vacation around your schedule instead of the weather! Lake Havasu City also enjoys warm air and water temperatures during most of the year. There are many Lake Havasu boat rental companies ready to help you get on the water. There are many launch ramps to get you going quickly, marinas to dock your boat, and boat fueling locations to keep it going. 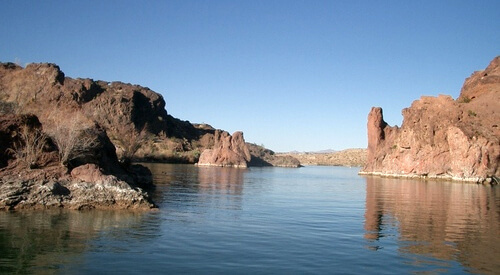 Lake Havasu City is also a perfect destination for fishing, swimming and all types of water recreation. Most hotels, RV parks, and campgrounds have boat trailer parking. Some have their own docks and launch ramps for guests. Lake Havasu City has restaurants of all types, shopping centers, attractions and numerous boat service businesses to keep your boat well-maintained. 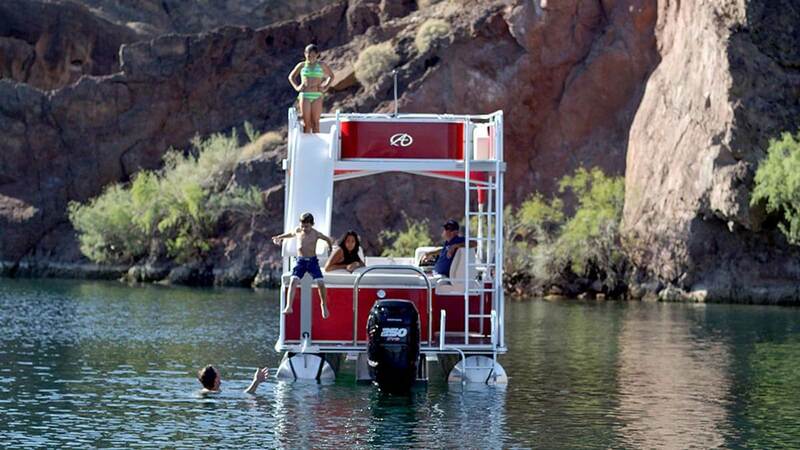 Boating on Lake Havasu won't sink you. It's one of the most budget-friendly lake boating spots in the U.S. Unlike some other boating lakes in Arizona, Lake Havasu does allow watercraft with two-stroke motors on the lake. However, boaters with two-stroke motors are urged to make sure their vessels are running properly prior to boating on the lake. Pack your shorts, flip flops and sunscreen, and come see why Lake Havasu City is a boating paradise and Arizona's Playground! Discover some lesser-known launch ramps to help you launch your boat faster. Don't own a boat or personal water craft? Learn about rentals in Lake Havasu City. Boaters at Lake Havasu can get a great meal without ever leaving the water.